I quite like shortbread cookies. I feel that they may be a bit heavy at times, so I can only eat 1 cookie at a time while I am normally a cookie monster. But they are always delicious nonetheless. 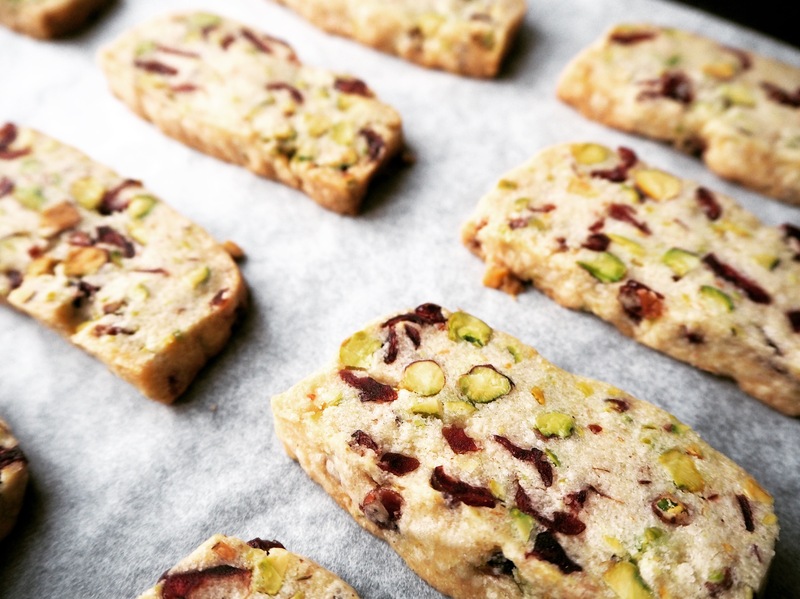 These ones, which I adapted from Joy of Baking, taste more than traditional shortbread cookies thanks to the addition of cranberries and pistachios. Besides the taste, they also look great with the perfect combo of red and green. 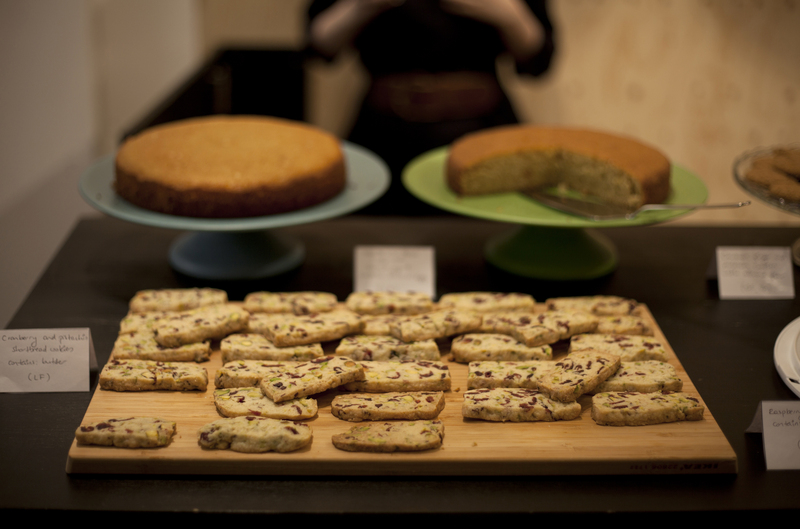 I served these in the December session of Creative Mornings Helsinki breakfast (I am their breakfast partner) and people loved them! Photo by Melek Elif Eren, from December 2017 Creative Mornings Helsinki event. 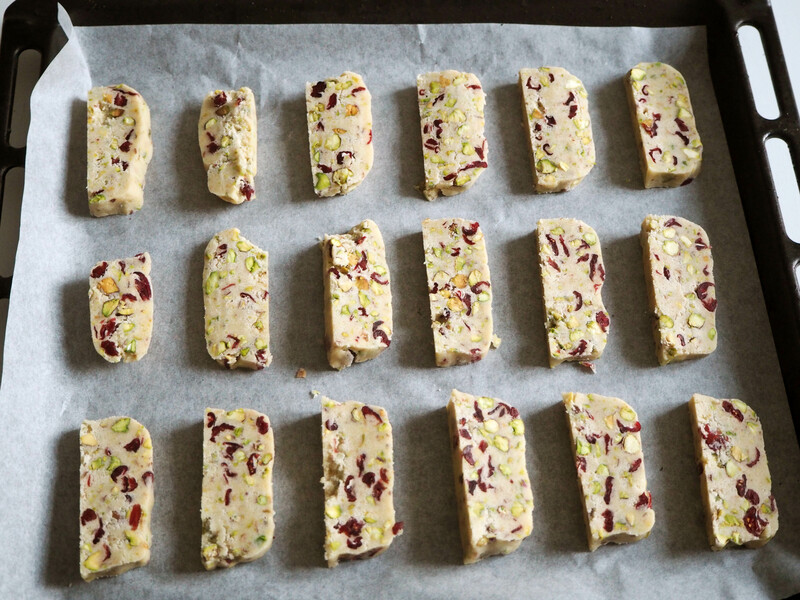 The cookies are quite easy to make, it only takes a bit time because you have to chill them in the fridge for a while. 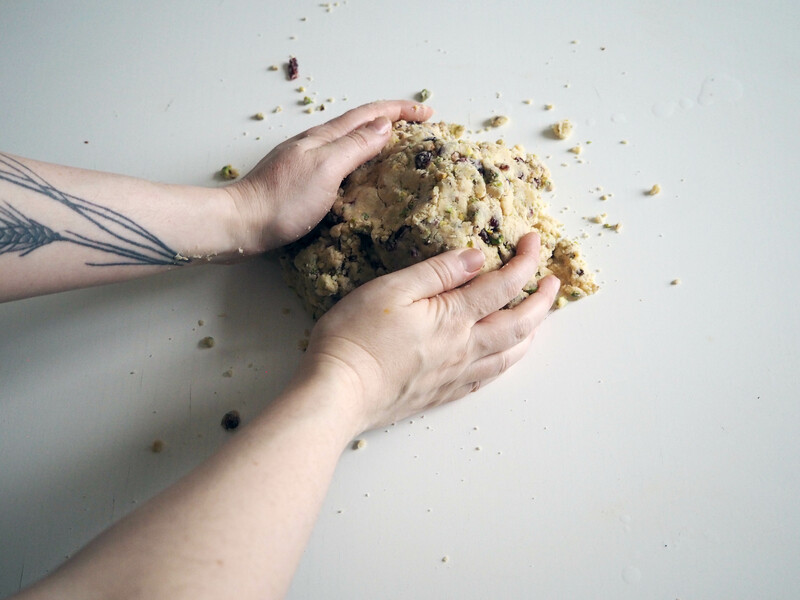 If you are having difficulties with time, you can make the cookie dough ahead, up to three days before, and then cut and bake them when you need to. 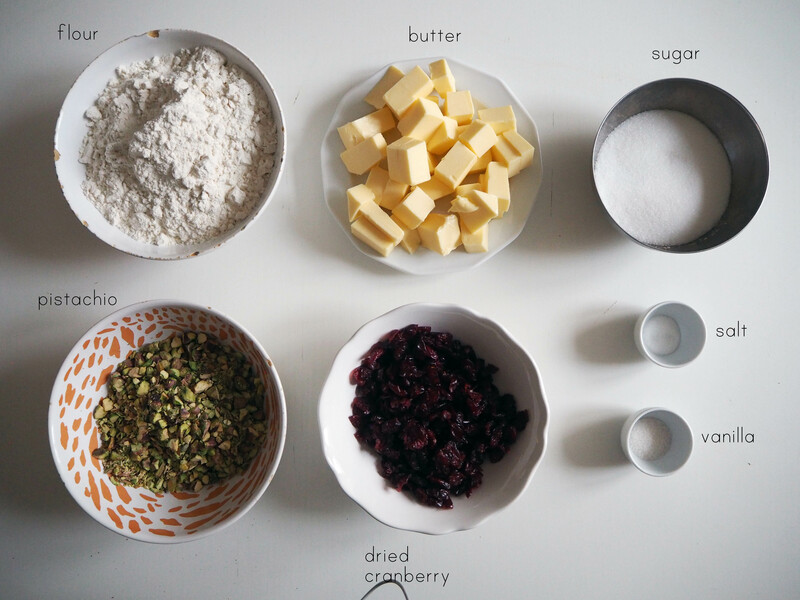 Remember to use a high quality butter for these cookies since butter is the most important ingredient of a shortbread cookie. Enjoy your cookies! 1. 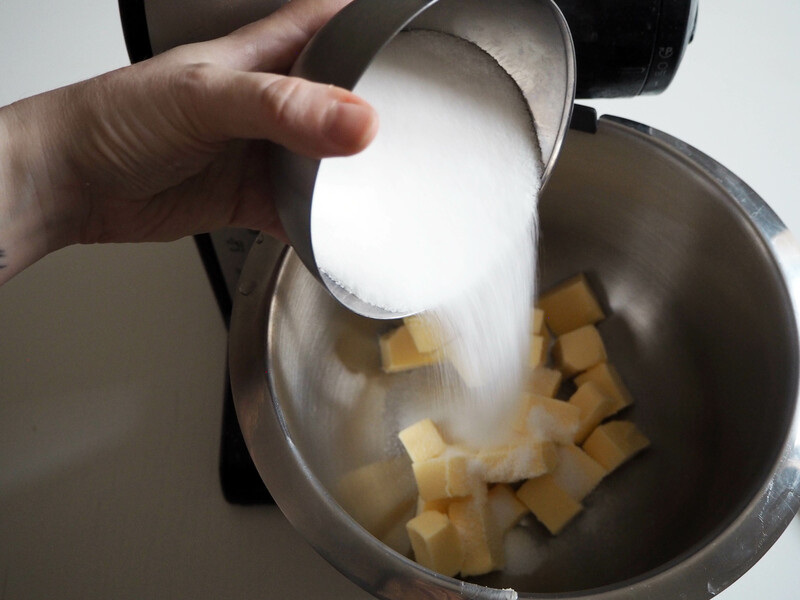 In a mixing bowl, put butter and sugar and beat until creamy. 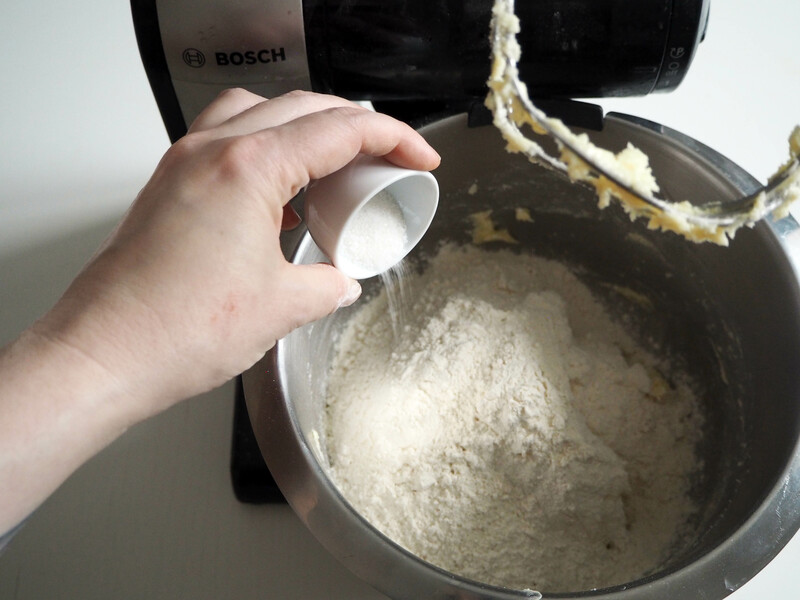 Scrape the sides if necessary. 2. 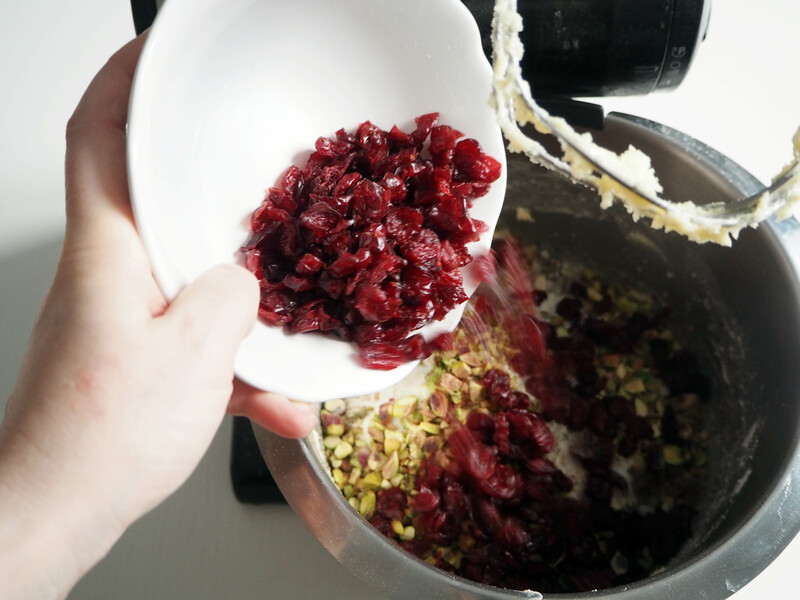 Add flour, salt, vanilla, pistachios and cranberries and beat until they are mixed. 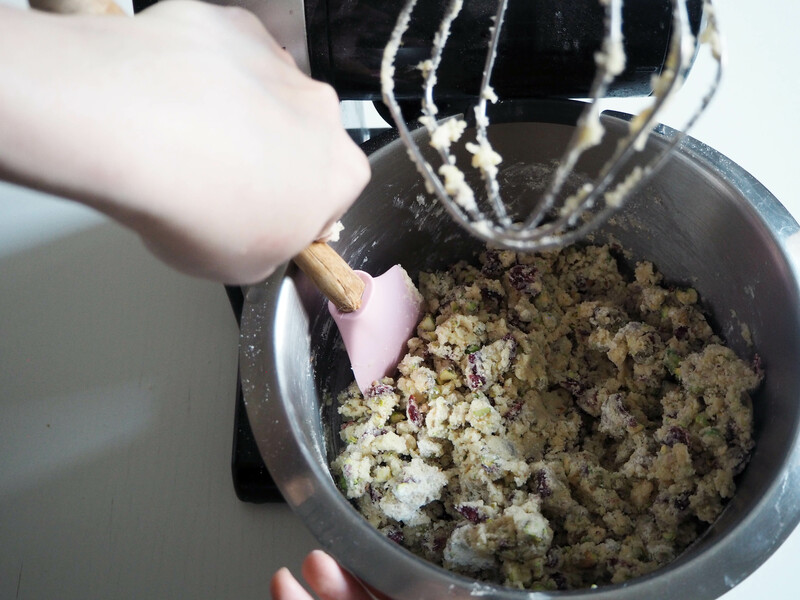 It will be a crumbly dough. 3. 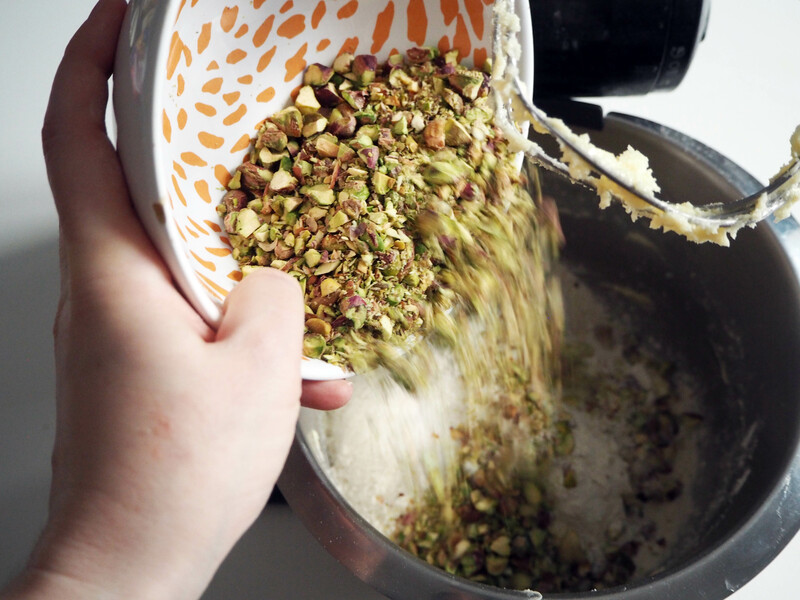 Scrape the sides of the bowl. 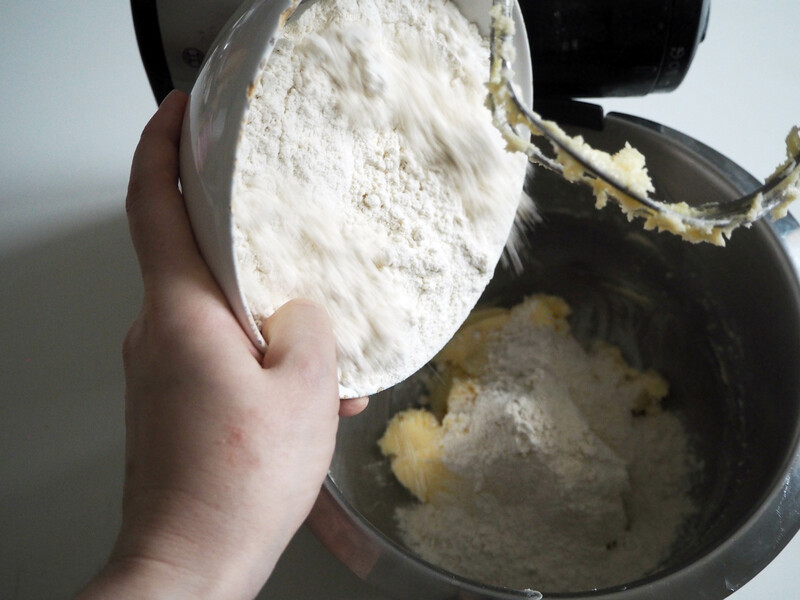 Take out the dough from bowl. 4. Put on the counter / table. 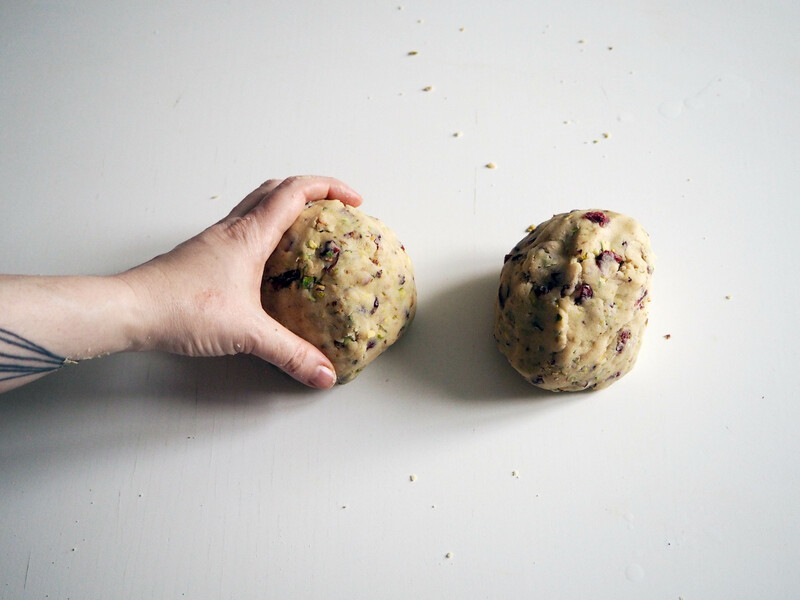 Turn it in two balls, roughly equal in weight (you can also be more precise and weigh them on a scale). 5. Cut two pieces of stretch film. 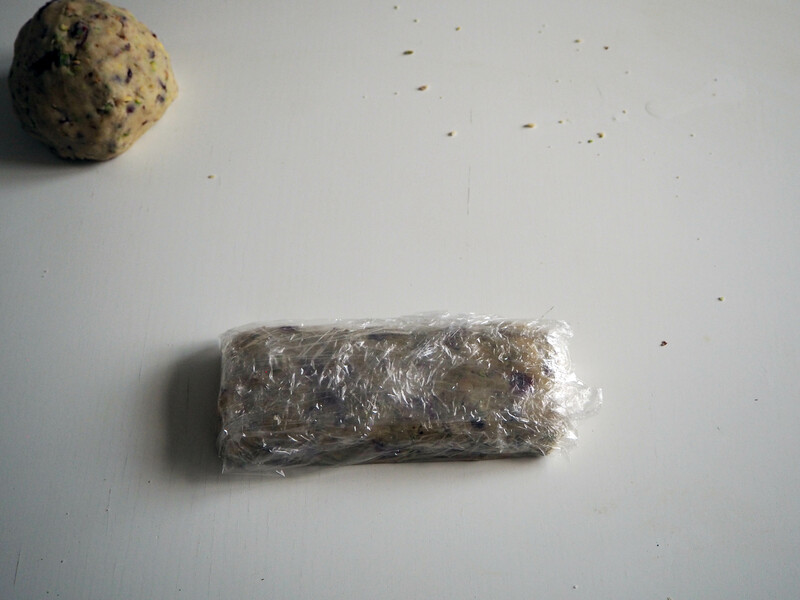 Put each ball on one piece of stretch film and shape into a rectangle log, as smooth as possible, about the size 7.5x20cm. 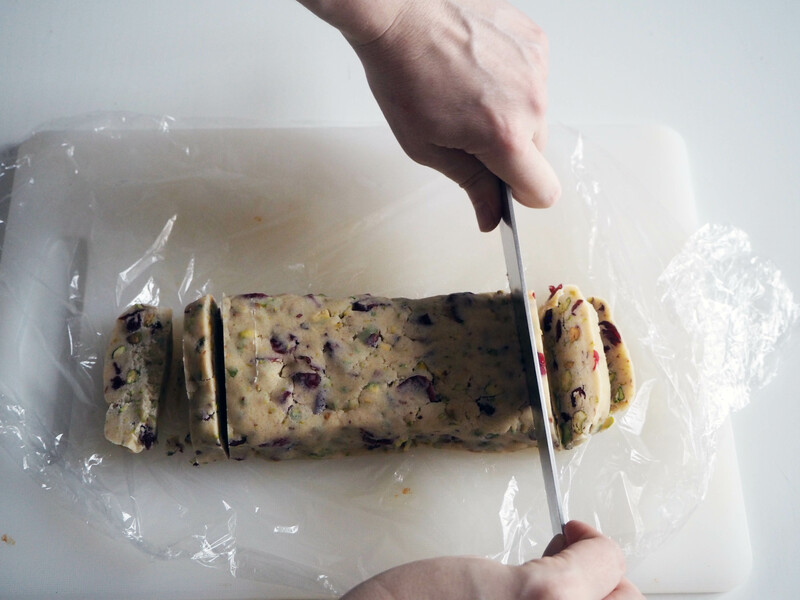 Wrap the dough and place it in the fridge for at least three hours, up to three days. 6. 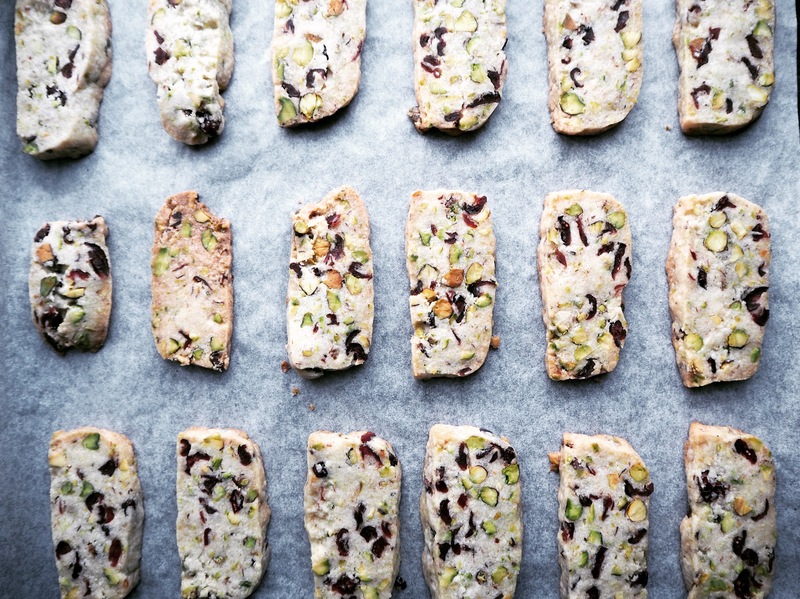 When you are ready to bake the cookies, preheat the oven to 170C. 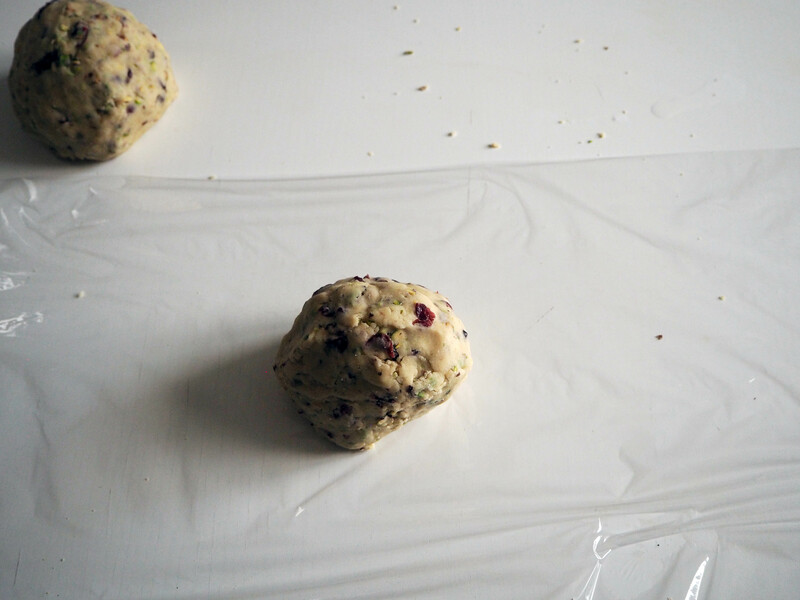 Prepare a few oven trays (as many as you need according to the size of your oven) and put a baking paper on each. Put them aside. 7. 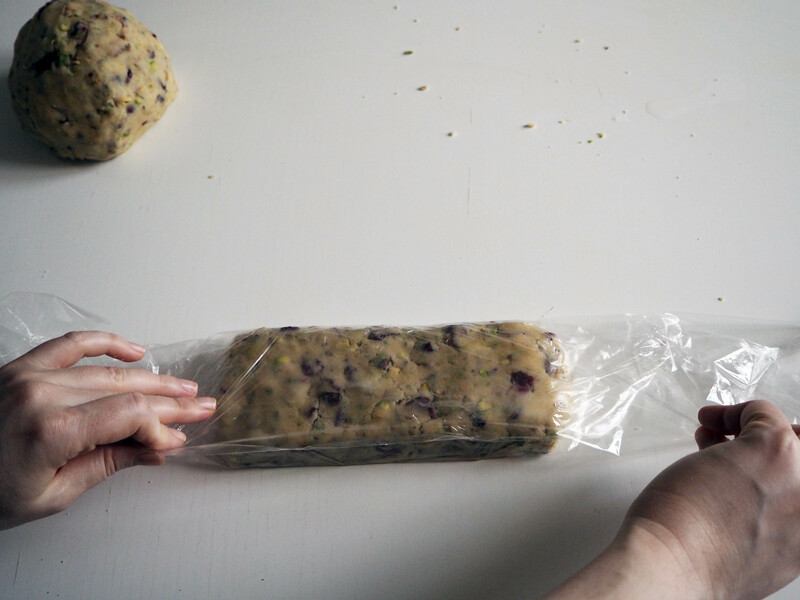 Take out one pieces of dough. 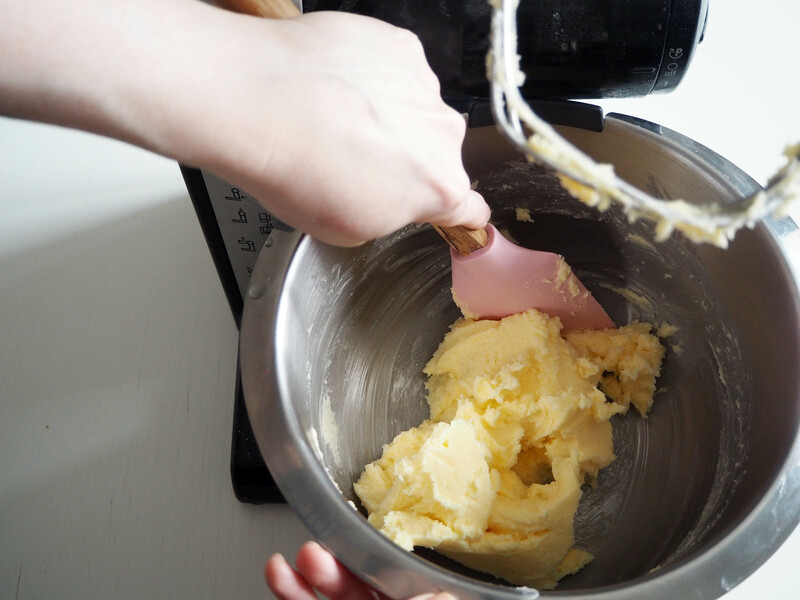 Leave the other in the fridge while other is baking so that it doesn’t get soft. Cut the dough in thin-ish slices with a sharp knife, about 1/2 cm thick and place them on the prepared oven tray(s). 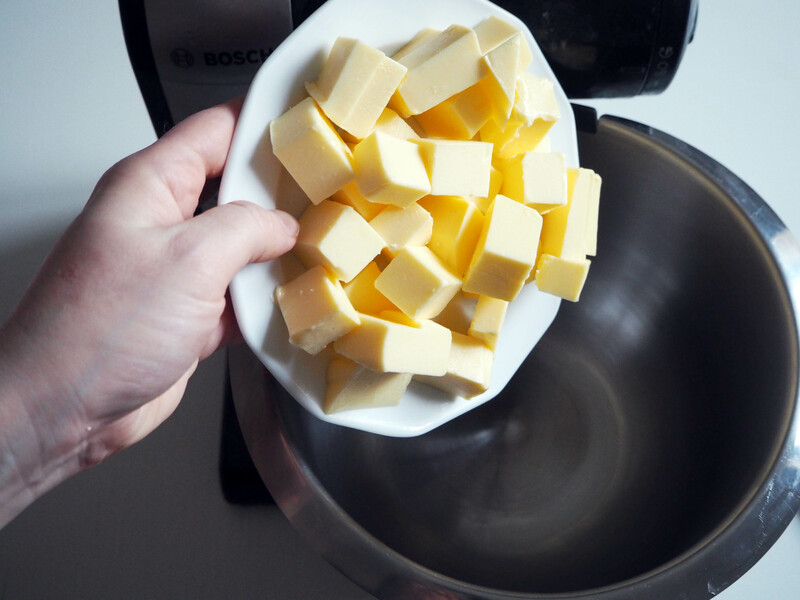 Bake immediately before they get too soft waiting to go into the oven. If one pieces dough makes more than one batch of oven tray, you can put the other prepared oven tray in the fridge while the first tray is in the oven. 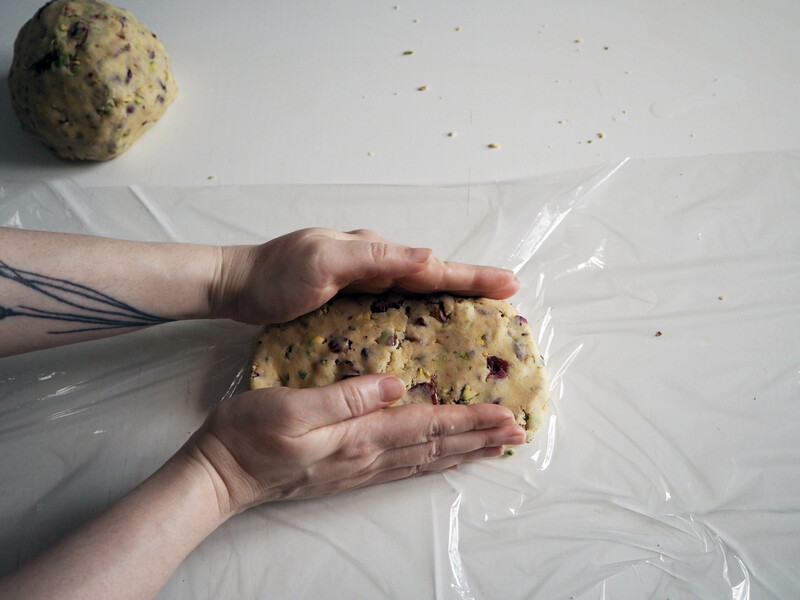 The thing is, if the dough gets too soft before going into the oven, they will spread too much in the oven and you won’t get good shapes but instead sheets. 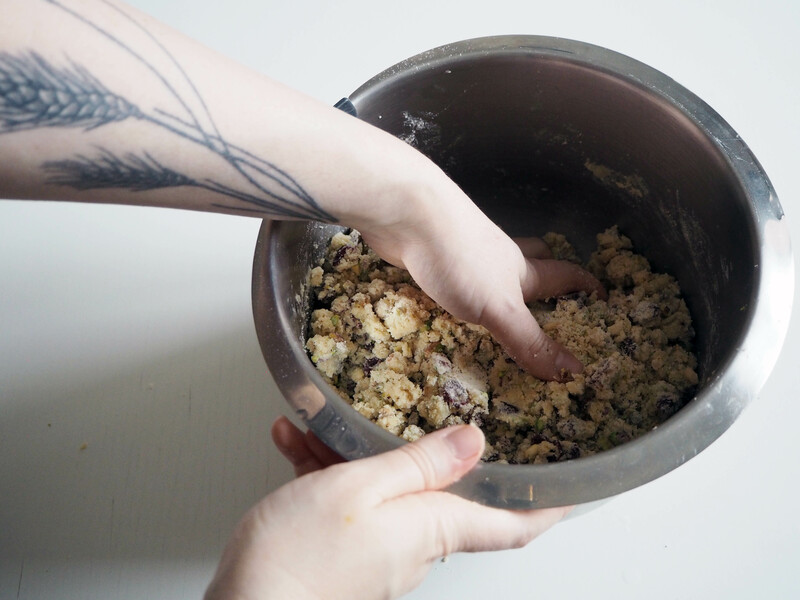 Bake the cookies for about 15 to 20 minutes, until the sides of the cookies just start to turn brownish (don’t bake too long, don’t let them get too brown since the shortbread cookies should be light in colour. 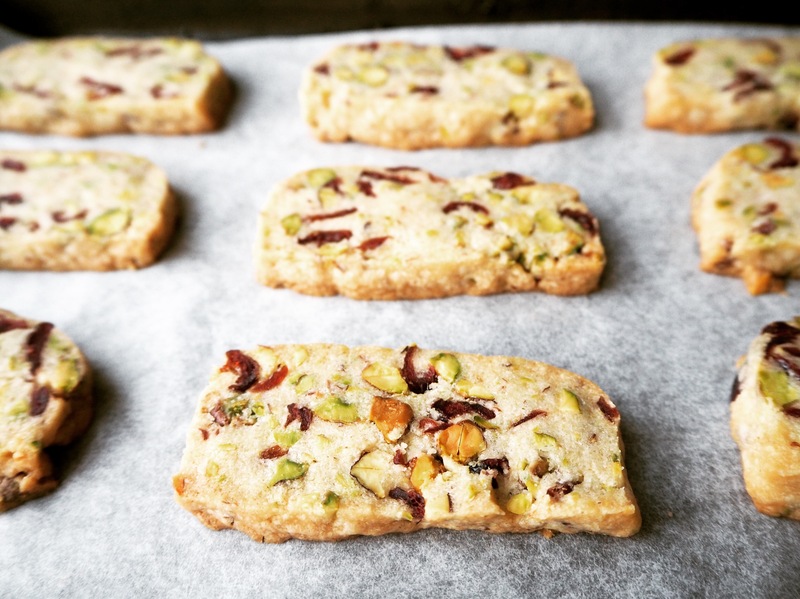 When cookies are baked, leave them on the tray for at least 15 minutes before transferring to a serving plate or before eating! Enjoy with a nicely brewed cup of tea or coffee! Without a doubt, I’m going to make these! They look utterly delicious! These look beautiful. 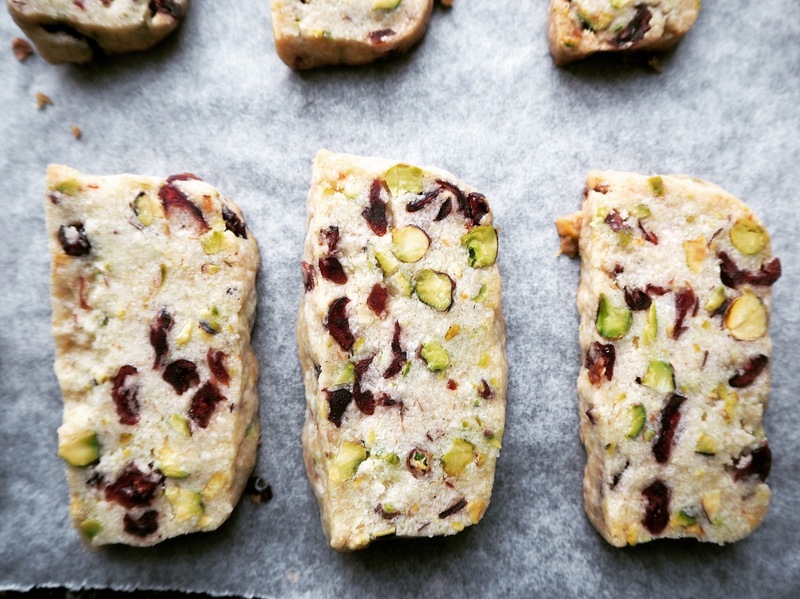 I love the combination of pistachio and cranberry! Dl stands for decilitre, volume measurement. 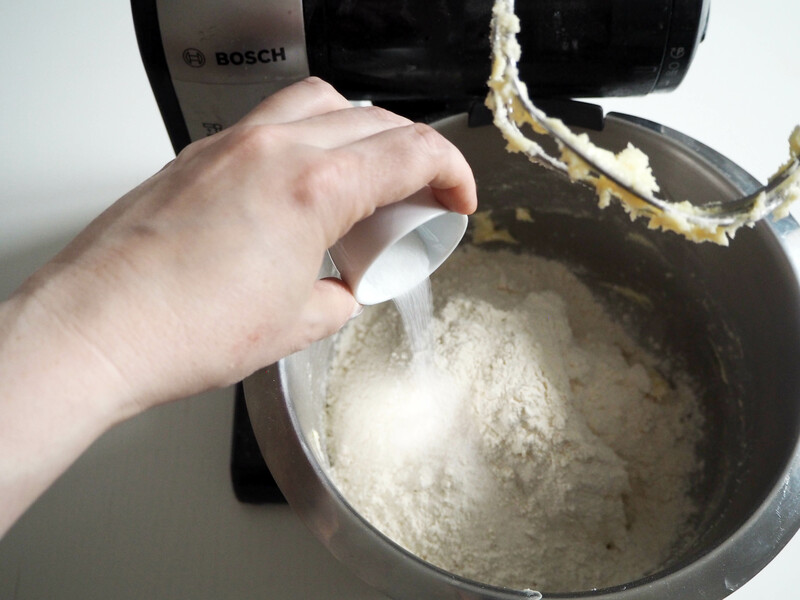 Previous PostLemon Cake With Coconut Yogurt – Smells So Good!